Peter Criss joined Kiss as their drummer in 1972 and established the Catman as his on stage persona, he went on to play under the moniker on and off for a further 32 years until he was permanently replaced in 2004 by Eric Singer who adopted the persona. 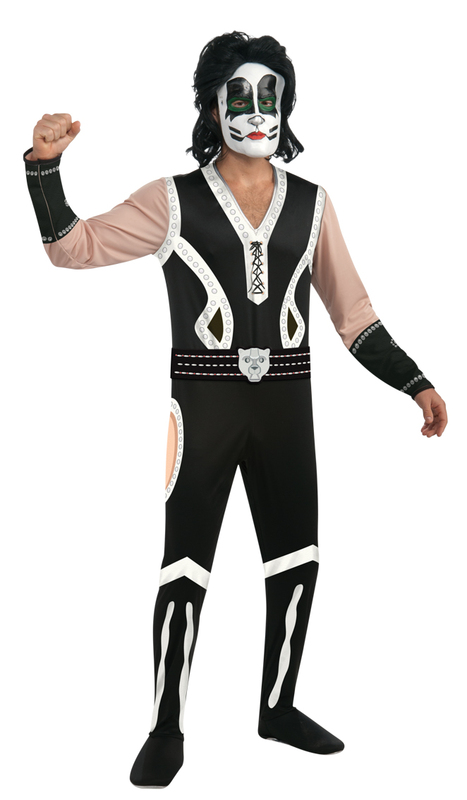 Like Eric you too can adopt the glam rock look of the catman with this fantastic fancy dress costume which comprises of a stylish long sleeved one piece black jumpsuit covered in printed silver rivet detailing and decorated with lace up detailing to the neckline and a printed belt with a cat buckle. Completing the costume is a pair of black and white boot toppers and a Catman mask. Perfect for any rock stars, pop stars and divas' themed fancy dress party or for wearing to a Kiss concert.